This Mangusta 108 offers comfortable accommodation for 8 /9 guests in 3 double and a twin cabin with Pullman berth. 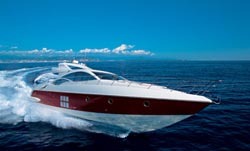 Rent this brand new Azimut 68S Yacht. Based in south of France close to Cannes, she will take you to the most remote or exclusive places of the Riviera in total comfort and speed! This Azimut 68S available for charter is very well equipped and features a unique and sleek style, a very large salon open on the outside deck and 2 spacious cabins, plus one twin cabin. Beautifully presented inside and out this stunning Predator 72 exudes style and grace. This fast yacht can cruise with up to 12 guests in total during the day and accommodate up to 8 guests overnight in 4 cabins, 2 double cabins both with ensuite facilities, 1 twin and a Pullman bunk cabin. Based in CANNES, the heart of the French Riviera, DLB YACHT BROKER offers a permanent selection of quality second hand boats. The Princess name has become synonymous with all that is finest in motor yacht design. Since 1985, Princess has grown on the foundations of our original core values; dedication to quality in both design and in build.